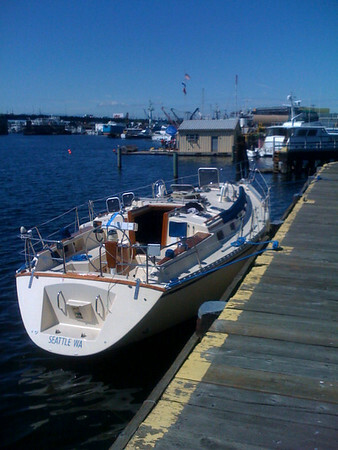 We splashed her on Friday sans mast and she's currently sitting on F-dock in a sublet slip at Shilshole. Patiently (nooo, not really) waiting for a slip assignment from marinacrats at the office. We're working furiously (nooo, not really) on the mast to get it prepped and ready to step. Our goal is to get her rigged and ready for an end of week re-naming party and a Labor Day maiden cruise. Here she is sitting outside of Canal Boatyard in Salmon Bay, happily back in water. Did you photoshop the sky to be blue? It never rains in Seattle.